For a complete recap of our Sucker Punch coverage, click here. It includes my set visit, on set interviews, trailers, posters, and a lot more. Finally, I’ll be doing video interviews with the cast this weekend, so if you have any questions, tweet me. I’m always looking for fun things to ask. She has been locked away against her will, but Babydoll (Emily Browning) has not lost her will to survive. Determined to fight for her freedom, she urges four other young girls—the reluctant Sweet Pea (Abbie Cornish), the outspoken Rocket (Jena Malone), the street-smart Blondie (Vanessa Hudgens) and the fiercely loyal Amber (Jamie Chung)—to band together and try to escape a terrible fate at the hands of their captors, Blue (Oscar Isaac) and Madam Gorski (Carla Gugino), before the mysterious High Roller (Jon Hamm) comes for Babydoll. Born from the creative vision of filmmaker Zack Snyder (“Watchmen,” “300”), “Sucker Punch” features an ensemble cast of young stars, including Emily Browning (“The Uninvited”), Abbie Cornish (“Bright Star”), Jena Malone (“Into the Wild”), Vanessa Hudgens (the “High School Musical” films) and Jamie Chung (“Sorority Row”). The film’s main cast also includes Carla Gugino (“Watchmen”) and Oscar Isaac (“Robin Hood”), with Jon Hamm (“The Town,” TV’s “Mad Men”) and Scott Glenn (“The Bourne Ultimatum”). Zack Snyder directed “Sucker Punch” from a screenplay he wrote with Steve Shibuya, based on Snyder’s story. Snyder and Deborah Snyder produced, with Thomas Tull, Wesley Coller, Jon Jashni, Chris deFaria, Jim Rowe and William Fay serving as executive producers. The behind-the-scenes creative team includes Academy Award®-winning production designer Rick Carter (“Avatar”) and “Watchmen” and “300” veterans director of photography Larry Fong, editor William Hoy and costume designer Michael Wilkinson. The music is by Tyler Bates and Marius DeVries. 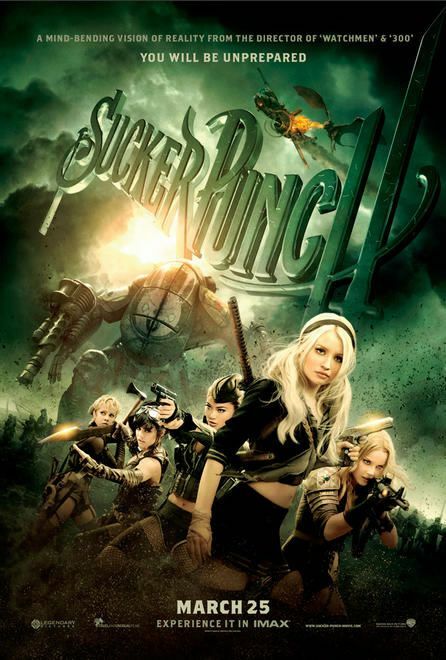 Warner Bros. Pictures presents, in association with Legendary Pictures, a Cruel and Unusual Production, a Zack Snyder film, “Sucker Punch.” Opening nationwide in theaters and IMAX on March 25, 2011, the film will be distributed by Warner Bros. Pictures, a Warner Bros. Entertainment Company.